The plague, throughout the ages, has been one of the most feared scourges. Old records are littered with reference of its devastation, prevention and cures. During such times, most sick people turned to the saints for hope. In St Peter’s Church, which stood where Lloyds Bank is now in Dover’s Market Square, a special place was given to St Roch for this purpose. He was also particularly venerated in the still standing, St Martin of Tours church, Guston. St Roch was born about 1350 at Montpellier, France, of wealthy parents who died when he was young. When he was about 17, Roch went on a pilgrimage to Rome. On the way at Acquapendente, north of Rome, he not only nursed suffers from the plague but they recovered! By the time, Roch reached Rome his fame had arrived before him and he was asked to nurse Cardinal Anglic, the pope’s brother. The Cardinal recovered and Roch stayed in the area of Rome nursing and curing others. About 1371, Roch was in Piacenza in Northern Italy when he too fell sick from the plague. In order to ensure he infected no one else he withdrew to the nearby forests to die. However, a dog found and befriended him and brought him food. On recovery, Roch, with the dog, returned to Piacenza, where the plague had taken a grip. He successfully healed people and cattle, which were also ailing. St Roch’s biographers differ over the locality of what happened next. Some say that he returned to Montpellier and was arrested as a spy, others, that he was arrested in Angera, Italy. Albeit, following the arrest, Roch was thrown into gaol where he died five years later, in 1380. That would probably have been the end of the legend had not the ecumenical council met in Constance in 1414. There pestilence raged and the council Fathers ordered a public intercession to Roch and the epidemic ceased. In 1485, relics of St Roch, now canonised, were enshrined in the church of San Rocco, Venice, where they remain. St Roch is seen as the protector against pestilence and also the patron saint of dogs and is depicted with a beard in medieval pilgrim garb. 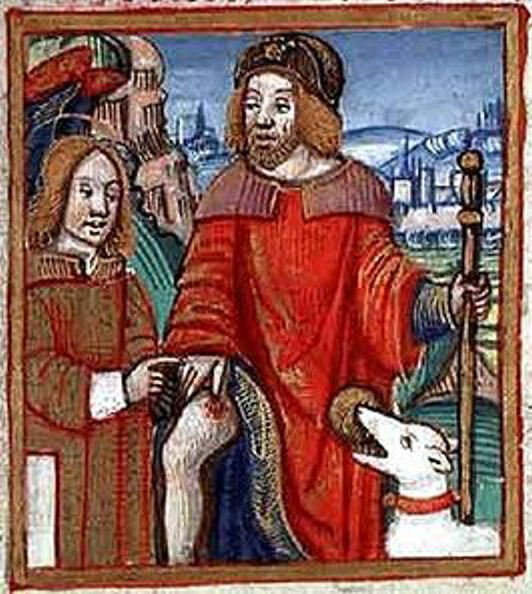 He is pointing to a sore on his thigh and a friendly dog is at his side. The dog sometimes has a loaf of bread in its mouth. 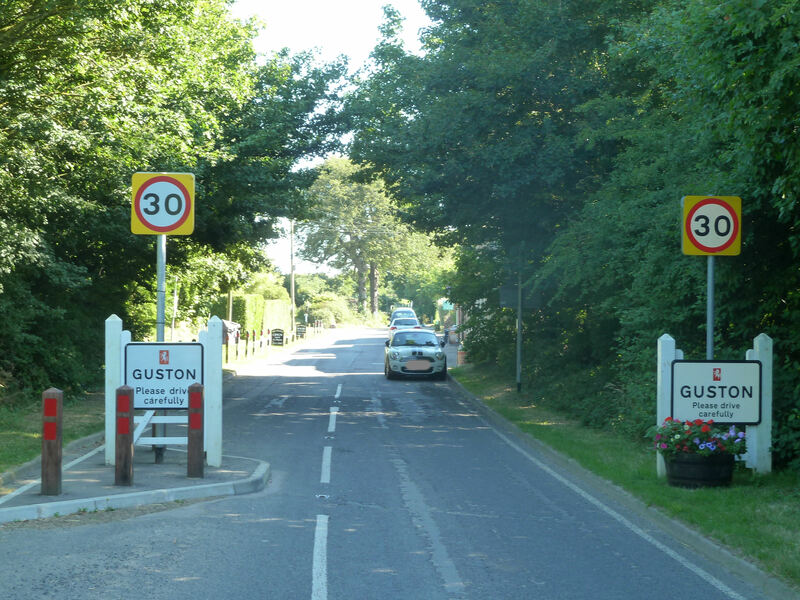 Guston is a small village to the east of Dover and was written in the Domesday Book (1086) as Gociston with other records referring to the village as Gounceston and Gusseton. 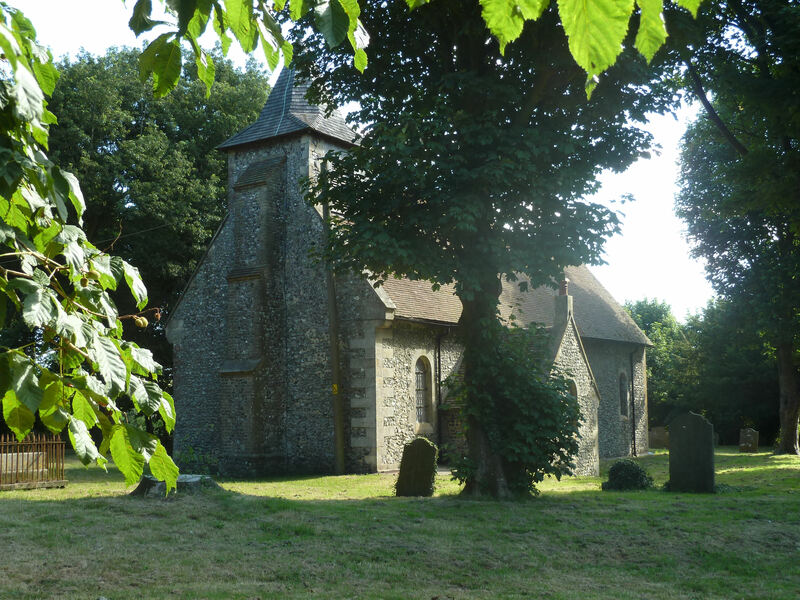 The church at Guston is dedicated to St Martin of Tours – the patron Saint of Dover – and was built in around 1090. It is listed by English Heritage as Grade II* – one of only 6 per cent of the most architecturally significant buildings in the country. The church initially belonged to the Augustinian Canons of St Martin-le-Grand, Dover, but following its demise in 1124 and the opening of Dover Priory in 1136, it came under the auspices of the Benedictine monks at Canterbury. Although small, the church was held in high esteem, possibly due to its land holdings that amounted to 109 acres of pasture according to a report of 1377. Two hundred years previously, inn 1179 the Abbot of Canterbury obtained a Papal Bull for the church’s confirmation to himself and his successors and thereafter and this was repeated several times. During the Middle Ages, the Church would have been decorated with wall paintings. These were covered with cement rendering during the 17th century Protestant fanaticism. It is recorded that in the church, up to that time, there were statues of the Virgin Mary, St Martin, St Nicholas and St Roch. Statues of St Roch, usually with his faithful dog, are still seen in many French churches and perhaps Dover and Guston’s proximity with France is the reason why he was venerated here. Of particular note, a bequest to pay for votive candles to all four saints was recorded in the Will of Edward Prescott of 1531. During the Civil Wars and the Interregnum (1642–1660) and the years that followed a descendent of Edward Prescott, also of that name, was well known as holding strong Non-Conformist beliefs as described in the story of Samuel Taverner, on this website. It could well have been he who organised the destruction of the statues! Statues of St Roch are still seen in many French churches and perhaps Dover and Guston’s proximity with France is the reason why he was venerated in both these churches. From the 17th century, the village of Guston became well known for its Goose fair that was held on 16 August – the feast day of St Roch. By that time, though the cult of St Roch had almost died out and dogs were believed to be the cause of the plague. In Dover, it was decreed that any dogs straying in the town should be destroyed, and a poor-man was paid two-pence for every one he killed. Nonetheless, the plague did break out on 1 August 1666 and lasted until Christmas, by which time about 900 hundred people had fallen victim. In order to bury the dead the corporation purchased a piece of land on Western Heights, which became known as the ‘Graves‘. Former Royal Victoria Hospital, High Street. In the 1832, cholera had reached epidemic proportions in Britain, during that year 32,000 people died from the disease, which is rapid in onset, has gruesome symptoms followed by death. 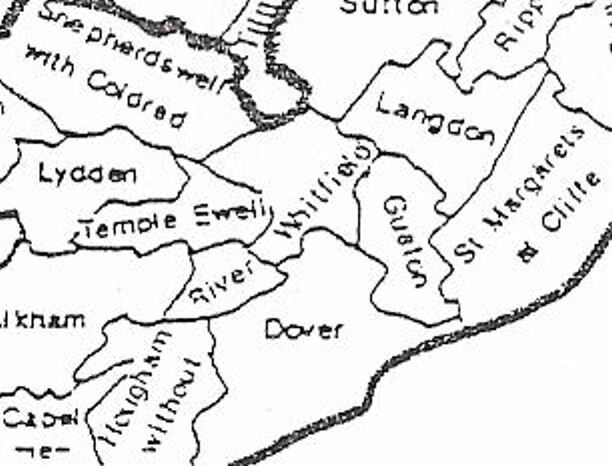 There was a second pandemic in the late 1840s and the cult of St Roch was revived in Dover. The town almost remained free of the disease and as a way of expressing thanks, £1,760 was raised. 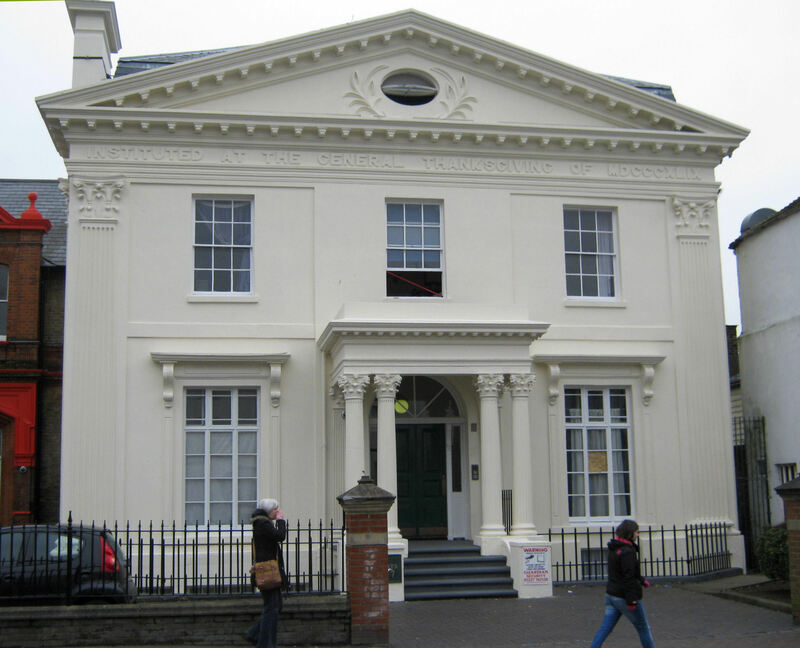 This was used to establish the Dover Hospital – later the Royal Victoria Hospital, on Dover‘s High Street, that opened on 1 May 1851. This entry was posted in Guston St Roch and the Royal Victoria Hospital Dover, Villages and Towns. Bookmark the permalink.